Now starting as low as $81 a night! Stay in a unique, rustic-yet-modern cabin made from a recycled shipping container. Cabins are available for rental seven days a week. Check in starts at 4pm. Weekly and monthly discounts available. We rent the cabins long term during the Winter months. Don't see any openings on your date? Things open up all the time! Just give us a call to get on the wait list. Each reservation also comes with two free tickets for every show during your stay. Outside food and drink limited to overnight guests only. Check out the lineup! CALL 406-222-3628 OR RESERVE ONLINE. Starting at $29. Choose one of our three tent sites. Cars may not be pulled to the tent sites. There is however overnight parking spots approximately 50 feet away. Sites do not include electricity but do have access to free wi-fi from the main Lodge, access to four newly renovated bathrooms with showers, sinks, commodes and potable water pump. Sites also come with two tickets to every concert during your stay. Sorry but due to zoning codes, we cannot accommodate RV's or Campers. Newly remodeled baths and showers are located in a separate building, approximately 10-40 feet from cabins and tent sites. 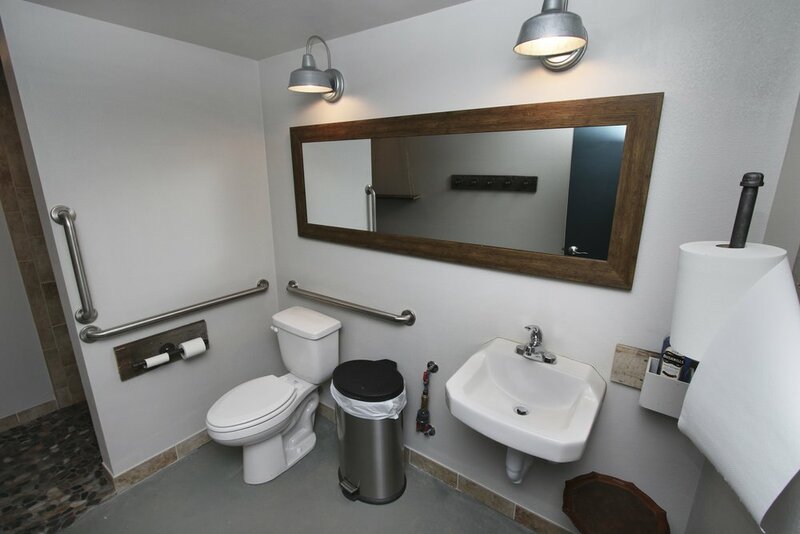 Guests have access to the four recently-remodeled private bathrooms, each containing a brand new shower, sink and commode.